1. The gray divorce rate has doubled since 1990. In 1950, 5 out of 1,000 married people over 50 divorced. By 2010, it was 10 out of 1,000. Roughly one in four divorces in 2010 involved couples over 50. 2. The biggest risk factor for late-life divorce is marital past. For couples over 50, the rate of divorce for those who are in remarriages is 2.5 times higher than for those in their first marriage. Those in remarriages of less than 10 years are almost 10 times more likely to divorce than those married 40 or more years. 3. Wealth can be a protective factor against late-life divorce. Studies show that those who divorce later in life are less likely to have college degrees or to be working. One reason may be that job insecurity can tear marriages apart. It may also be that more affluent marriages have much more to lose in a divorce. 4. When a long marriage ends, the seeds of the marital failure may have been sown decades before. Long marriages rarely end on a whim. There may be festered resentment or unresolved issues that go on for decades before the divorce becomes a reality. 5. Kids struggle with the reality of parental divorce – whatever their ages. Divorce is tough on kids, no matter their age. Divorce can negatively impact parent and adult child relationships. 6. Grief can linger long after the marriage ends, even when both agree it is better to part. After all, you did spend years and build a life together. Even if you are better apart, it is still normal to grieve a loss. 7. There can be positive outcomes to late-in-life heartbreak. Sometimes improved health and happiness. Sometimes relief and a feeling of peace. And sometimes finding love again. 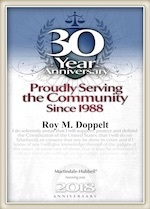 Call the Law Offices of Doppelt and Forney, APLC today to schedule a free consultation with an experienced lawyer. We represent clients in family law court in all of the court houses in San Diego County including downtown, Vista, Chula Vista and El Cajon.